On March 14th, 2013 Provisional Sinn Féin MLAs Jennifer McCann and Sean Lynch, met with Vice royal Theresa Villiers, regarding the continued internment of Marian Price and called for the immediate release of Marian Price according to MLA Jennifer McCann. 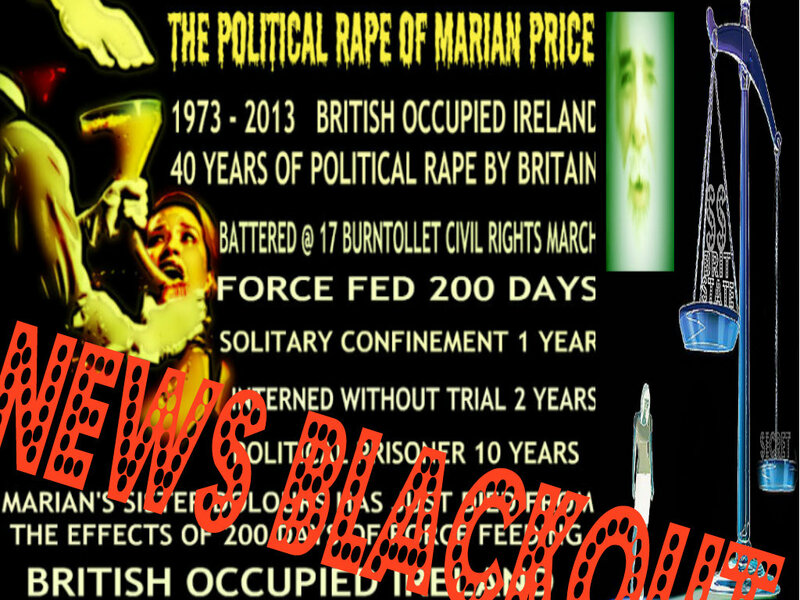 Since that time there has been a complete media print blackout on the political internment of Marian Price. On March 14th, 2013 Provisional Sinn Féin MLAs Jennifer McCann and Sean Lynch, met with Vice royal Theresa Villiers, regarding the continued internment of Marian Price and called for the immediate release of Marian Price according to MLA Jennifer McCann. Ms. McCann said, “The meeting followed a visit that Martin McGuinness and myself had recently with Marian Price and the presentation made by Martin at her parole hearing last week. At the meeting with Theresa Villiers, Martin Guinness made it clear, that Ms Price was not a threat to the public and that she should be released without further delay. I gave a detailed account of the deteriorating condition of Marian Price's health, which has been added to by the recent death of her sister Dolours Price. Since this statement was made public, there has been a news blackout with regard to Marian Price, with all written material published censored. A Google search will confirm this. Inter agency communiques on Marian Price are also being manipulated, along with material on both Twitter and Facebook. 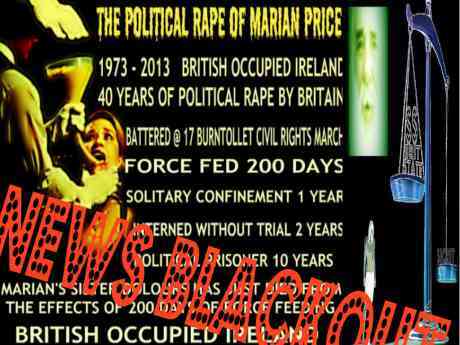 It is the responsibility of ethical news agencies to investigate this matter immediately and confirm the welfare of Marian Price publicly, as there considerable public concern for Marian's welfare and the exercise may be further punishment to the many people concerned worldwide. Media Blackouts like political internment are act of war that neither belong ina genuine democracy or in peace time. The Irish peace process has been considerably undermined by the British Tory Government since coming to power. According to Wikipedia a Media blackout refers to the censorship of news related to a certain topic, particularly in mass media, for any reason. A media blackout may be voluntary, or may in some countries be enforced by the government or state. The latter case is controversial in peacetime, as some regard it as a human rights violation and repression of free speech. Press blackout is a similar phrase, but refers specifically to printed media. Media blackouts are used, in particular, in times of declared war, to keep useful intelligence from the enemy. In some cases formal censorship is used, in others the news media are usually keen to support their country voluntarily as in the UK system in the Second World War. During World War II, the US Office of Censorship sent messages to newspapers and radio stations, which were acted on by recipients, asking them not to report any sightings or explosions of fire balloons, so the Japanese would have no information on the balloons' effectiveness when planning future actions. As a result the Japanese learned the fate of only one of their bombs, which landed in Wyoming, but failed to explode. The Japanese stopped all launches after less than six months. The press blackout in the U.S. was lifted after the first deaths from fire balloons, to ensure that the public was warned, though public knowledge of the threat could have possibly prevented the deaths. News of the loss of over 4,000 lives when UK ship RMS Lancastria was sunk during the war was voluntarily suppressed to prevent it affecting civilian morale, but was published after it became known overseas. In 2008, the fact that Prince Harry of Wales, third in line to the British throne, was serving on active duty in Afghanistan was subject to a blackout in the British media for his own safety. He was brought home early after the blackout was broken by foreign media. The Times asked other major news organizations to do the same;NPR was among dozens of news outlets that did not report on the kidnapping at the urging of Rohde's colleagues. Kelly McBride, who teaches ethics to journalists at the Poynter Institute, says she was "really astounded" by the media blackout. "I find it a little disturbing, because it makes me wonder what else 40 international news organizations have agreed not to tell the public," she tells NPR's Melissa Block. McBride says the blackout could hurt the credibility of news organizations. "I don't think we do ourselves any favors long term for our credibility when we have a total news blackout on something that's clearly of interest to the public," she says. In 2009, on the 20th anniversary of Tiananmen Square protests of 1989, a number of social media websites were made in accessible and foreign television reception disrupted in China. On January 18, 2012, Wikipedia itself participated in a media blackout to protest SOPA."